Why can't I see production tasks on the calendar interface? Why can't I see my content items on the calendar interface? Why are some campaigns displaying at the top of the calendar and others inline? 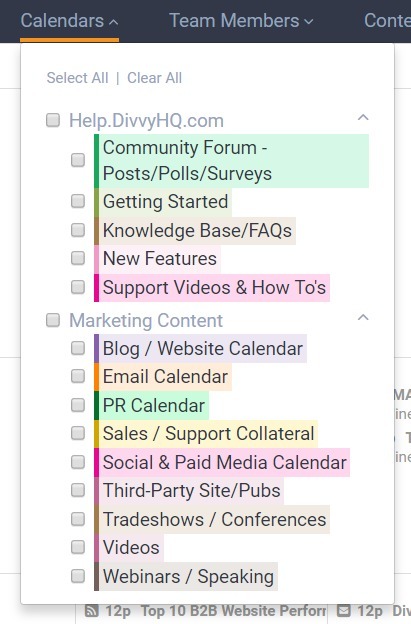 Is there a way to export or share my calendar view with someone outside of Divvy? This section provides an overview of the Calendars filter located among the filters in the Calendar interface. By clicking on the Calendars filter drop-down, you will be presented with the list of calendars to which you currently have access. You can select all calendars, single calendars, or a combination by clicking the checkbox to the left of each calendar. Clicking the green Filter button, located to the right of the filter options, will immediately display content items for the calendars selected. For Enterprise accounts, we allow the collapsing and expanding of all Child Calendars listed under a Parent Calendar, by clicking the caret to the right of the Parent Calendar. Divvy will remember your collapse preferences so you can customize your Calendar Filter dropdown.